The Scott Elsa is an emergency life support set and provides 10 minutes of breathing air. The Scott Safety Elsa is a 10-minute escape set, designed to provide a constant flow of air. It consists of a constant flow hood, cylinder with combined cylinder valve and reducer, a supply hose and a carrying bag. 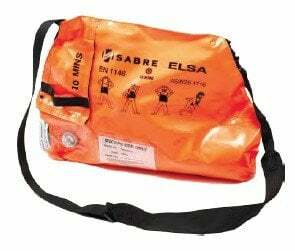 The Elsa is suitable for marine applications and industrial rescue applications. Both the constant flow hood and the carrying bag come in a highly visible colour and are flame retardant. The bag is also chemical splash-proof. The hood is suitable for those with glasses, beards and long-hair, where a face mask may not be.